Read short testimonials of faith from some of MCGI’s youngest brethren baptized on October 1, 2015 at the Ang Dating Daan Convention Center in Apalit, Pampanga. I was brought here by Bro. Prencinillo, and I really wanted to be here. He always brought me to the locale. In September, he invited me to attend the indoctrination. I don’t remember the exact date, but it was in the Locale of Piquan, Nueva Ecija. He brought me to a Bible Exposition that I may get a copy of the Bible. He actually brought me to a Mobile Coordinating Center. I felt light, because before coming here, I really felt heavy. But after I got baptized, I felt light. Many thanks to Bro. Eli and Bro. Daniel. I really wanted to learn the teachings of God. I wanted to be enlightened of all His doctrines. I was invited by my workmate, Bro. Guillermo. That’s when I started to listen to Bro. Eli. I have tried attending in other religions, but it’s only here where I heard [the teachings of God], where I understood everything. It was in September, September 11th if I’m not mistaken. I think it was a Bible Exposition. When I heard the preaching, that’s when I believed. With others, it’s just with their own words. But with Bro. Eli, it’s through verses. That’s when I really got enlightened. He doesn’t just speak. But he takes everything he says from the Bible. I felt light inside. I felt that I wanted to get rid of every unpleasant thing I’ve done before. With Bro. Eli, I’m thankful because I got enlightened now. I hope that in the coming days I will be more enlightened of the teachings that I will learn. Thanks be to God because He gave you wisdom to be able to share what is right. I actually felt bothered by my conscience already. I have been delaying, disregarding this for so long. Then, just all of a sudden, I felt my conscience telling me that I really needed to join already. My papa has been a member since 2001. He’s 14 years already in the Church. He was the one who told me to attend the indoctrination. Mixed emotions. Before I got immersed in the water, all I felt was being sorry for my sins, as I had committed many. I had done many wrong things. I always felt irritated before. After baptism, I felt light inside. I hope that they will be able to continue. I also hope that Bro. Eli and Bro. Daniel will be healthier that they may be able to preach the words of God. 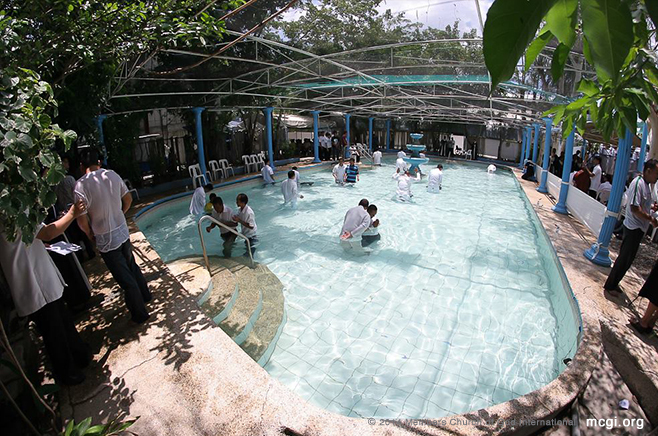 Read short testimonials of faith from some of MCGI’s youngest brethren baptized on September 25, 2015 at the ADD Convention Center in Apalit, Pampanga. I found this to be the true religion. Also, this is where I found the answers that I have been searching for. I first listened on television. Then, my wife became a member [in April of 2015]. Before, I would just drive my wife to the locale. She would invite me in, but I declined at first. Though, I felt even then that I wanted to join her there already. One time, I did go with her. When I got there, I really liked the teachings in the Church. When I was a Catholic before, we worshipped idols. Now, when Bro. Eli read the teaching concerning that, it hit me and I realized that what we did was wrong. I felt happy. I felt that my doubts in life are gone. Bro. Eli, many, many thanks because I learned the true teachings of God from you. Also, I thank him for welcoming me here in Apalit. Many, many thanks. It’s here where I better understood the teachings of God. My uncle is already a member here. He invited me to get indoctrinated. Even at the onset of it, the reason why you need to get indoctrinated first before becoming a member of the Church of God is explained. I felt light inside. Before, even when I got baptized in the Born Again, in the Adventist church, I felt that I still had my sins. I didn’t attend in those much, because I felt bored. I listened to the teachings there, but it’s here where I better understood everything. Here, Bro. Eli explains every prohibition of the Bible. Of course, I’m thankful because there are preachers like them who teach for people to better understand the doctrines of God. Firstly, I wasn’t really active in Catholicism because it was like nothing was happening. Before we got indoctrinated, many things troubled my husband, so we thought to not push through with the indoctrination. That time, Satan won; he won. So that same night, we went to the locale and listened to the doctrines. That’s when it started until we have arrived to this point. My husband and I were both baptized today. It was my first time to hear such doctrines. I realized that there were many dos and don’ts. It’s unlike in Catholicism. I have aged and all and yet I didn’t know that what I was doing was wrong. I didn’t know it, because nobody taught it. It was only Bro. Eli who preaches what is acceptable, what is not, and what we should do. I was crying. I was really crying. I didn’t anymore hesitated. I said, “I’m really going to pursue this.” Actually, I’ve long wanted to, but many things just got in the way. I hope that his life will be longer as he is already old. I also hope that many more people will be able to listen to his preaching. I saw in the truth in the teachings taught by Bro. Eli. Everything he said was undoubtedly true and has basis; all of it is from the Bible. When he preaches, there’s nothing added nor taken away, but teaches what is written in the Bible. It is unlike in other religions wherein they either add or take something away, just make things up. I saw this on Youtube, and I studied it first before joining here, whether it was right and whether it was really the words of God that are being preached. When I found everything spoken is the truth—nothing lacking, nothing added, and with basis—I didn’t anymore have second thoughts to join this day, September 25. This is my own decision. I voluntarily came here. Actually, nobody lead me here. I was formerly a Catholic. In Catholicism, there is idol worship, praying to graven images; they even kneel before those things. Thus, I thank God that despite being stricken by years already, my mind has been enlightened. Thanks be to the Lord that He lead me to the true Church. My feeling was so light. Before I was baptized, I was reflecting while sitting on my chair. I just suddenly felt that my tears were falling, that I was crying. It was like I suddenly surrendered myself to Him, to the Lord God and His Son, our Lord Jesus Christ. I have repented of all of my past sins, of all the wrong things I’ve done. I hope that they will not tire in helping and leading all the lost souls unto the true Church of God. 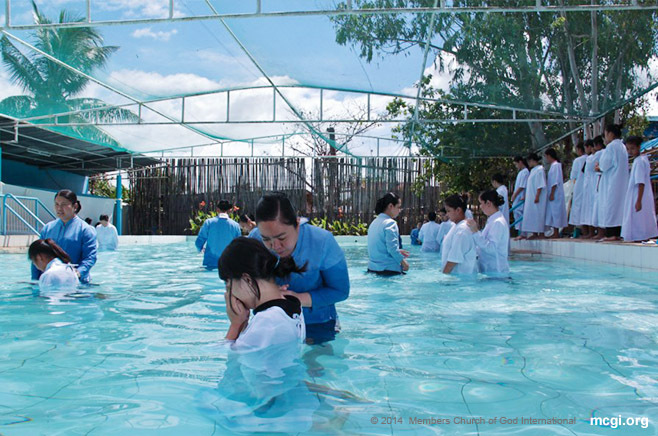 Read short testimonials of faith from some of MCGI’s youngest brethren baptized on August 14, 2015 at the ADD Convention Center in Apalit, Pampanga. My partner for five years has been a member since 2006, so he accompanies me to gatherings. Actually, his entire family are members. Before I just saw Bro. Eli on television. I didn’t listen to him though; his channel was something that I just passed by as I surfed. It was in the Locale of Marikina on a Saturday [when I first attended]. It was a Thanksgiving service. It struck me as different at first because the people were singing and dancing; it didn’t feel strange though. I really couldn’t say anything about [the doctrines]. I have long been a Catholic. When I was a child, I also tried to be a Born Again member. But never did I recall that we did a Bible Study. Here, you will really understand something, and you can apply it. I feel so light. It’s like the feeling after a normal shower, only 100 times better! Is there anything I can say that means more than “Thank you”? If they weren’t there, many people would not be able to return unto the Lord. There are so many people here because of them. If there’s one word that means greater than “Thank you,” that’s what I would say. I wanted to join. I didn’t join any other church but this as I like it here. Also, all explanations are clear. I liked them. In Catholicism, I didn’t like it there. Sis. Perlita was the one who invited me here. She has been a member for five years now. I feel pleasant and light. I’m thankful for them because if it weren’t for them, I wouldn’t be member of the Church today. I’m thankful for everything they have taught; nothing is evil. All of the things they taught are good. I just really wanted to join. Actually, I didn’t force my husband to come with me. I just pursued to get indoctrinated and become a member here in the Church of God. It’s because I heard Bro. Eli’s doctrines. My husband was the first to be indoctrinated, and he brought me with him to gatherings. He was just baptized last July 24, 2015. My mind was enlightened, and the word of God entered my heart that’s why I was enlightened. I was a handog (offering) in the Iglesia. My parents, even my grandparents from both sides of the family, are Iglesia ni Cristo members. Wearing modest apparel is something that they did only occasionally. Also, the contributions there are many. I felt relieved, as if all my doubts in life are gone. My wrong faith has been changed. Bro. Eli, many thanks for your doctrines. My heart and mind have been enlightened by the true teachings of God written in the Bible. I like what Bro. Eli is preaching; we have watched him on television since about two years ago. My husband liked it too, so we decided to attend indoctrination. Regarding the doctrines, I’m already 32 years old and it’s my first time to hear the one about women’s apparel. In a free religion, there are no prohibitions. I feel happy. I can’t explain it, but my tears just suddenly fell back there. Perhaps, it was because of the relief I felt inside. I hope that you will continue you works for people like me who are sinful, that many more may return unto God. Read short testimonials of faith from some of MCGI’s youngest brethren baptized on August 7, 2015 at the ADD Convention Center in Apalit, Pampanga. I chose to leave a chaotic one [religious group], and this is where I found the right teachings. I was able to listen via radio in Isabela Province after I came back from Saudi Arabia. My girlfriend introduced this to me. Also, I have an uncle who is also a brother-in-faith. He was the one who urged me to go on with the indoctrination. I felt lighter as compared to when I was in the INC. Many thanks Bro. Eli. Because of you, I was able to listen to the truth. I’m also thankful because God still gave me an opportunity to know Him through Ang Dating Daan [The Old Path]. My heart, my mind were more enlightened that it’s really different [from my previous religion]. So, I decided to keep listening and continue with the baptism. My husband and I were listening [to the program]. He also read the Bible as he was a Born Again Christian before. He told me, “Let’s listen,” and I saw that it was all right. The difference is great, especially with what I learned since I was little until I grew up. In Catholicism, they don’t read the Bible. With my husband’s, they needed to learn to read it. But with Bro. Eli, my understanding deepened even more. I felt different. As Bro. Eli said, you have to forget the sins you committed and those who have committed sins against you. I hope they will continue their preaching that many more people who do not know God may know Him the more through that means. The teachings are really good here in the Church of God. It’s only now that I came across something like this, because in others, you won’t see this: the true teaching. I really feel that it’s true. My husband and I have long been listening, for about 10 years now through television only. The time came when he became a member already, and I got encouraged to join as well. He just went first. Also, I’m sick. As far as what the doctor has told me, I won’t get better anymore. But I thought, it’s only the Lord who can heal us. That’s also another reason why I joined here. I was smiling because I felt so happy inside. I was crying as well, but because I was happy. I hope that their program will continue so that they may be able to help many more people. The teachings are really good. They are really related in the Bible. The owner of the house we rent invited us. It was my first time to listen on the first day of our indoctrination, it was on August 1. The [doctrines] are good, and can change your views in life. Even when I was just first attending the indoctrination, I didn’t feel physically well to the point that I didn’t almost want to attend. But as the days passed by, until the seventh day of indoctrination, it was gone. Before, I had trouble walking. I was palpitating whenever I walked. I couldn’t even walk short distances. Now, when I attended today, especially after I got out of the swimming pool [baptistery], I have been walking seven times back and forth here already; it’s like my former strength has returned. I’m amazed because it’s like all I needed was a dip in the pool, but I believe it wasn’t only as is. There really was something there. I have long been bearing the pain, about two years already. But it’s only now that I have felt like this again. I hope that the feeling continue because I want to be able to work again. I hope that their preaching will continue that many more people will join. To obey His commandments, and fulfill the laws that we must do as a human being, as His servant, as His disciple. I got to listen through my brother and mother; also, on radio and television as well. I felt light. After I got out of the water, it felt like there was light, though my eyes were closed. I’m thankful that God used you as instruments in sharing the word of God. Let us continue praying for the ministry that the propagation of the Lord’s words will be wider in extent. Many thanks for keeping your duties of imparting the word of the Lord to us. 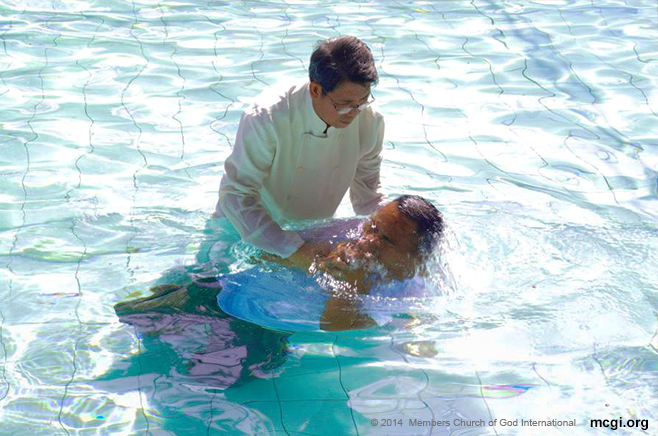 Read short testimonials of faith from some of MCGI’s youngest brethren baptized on July 31, 2015 at the ADD Convention Center in Apalit, Pampanga. I got encouraged to join as well because I study in La Verdad Christian College. It’s because this is where I saw the true Church that the Bible speaks of. Also, I really felt that I can avoid the things that I mustn’t do, which I really liked doing back then. It’s like I have accepted that truth already. I was crying and crying back there. It’s like in the movies when everything I have done came flashing back to me. And now, I’m here, on this moment that I have been waiting for. Thanks be to God because if I hadn’t known them, I wouldn’t have learned the things I now know. My mind was enlightened to the truths that aren’t being taught by preachers in false churches. Before, I didn’t believe in the Lord. However, I also had a sickness before; I thought I was going to die. I promised the Lord then that I would serve Him. I made a vow. I vomited repeatedly. My whole body soon felt weak, and I was dizzy. Actually, I just avoided the doctor [after seeing him] so that I could just recuperate at home. It happened only last year. I’m thankful that my physique has returned. Our housemate and our son have long been members. [Our son] resides in Manila, but he came here to us in Pampanga. They invited my wife first. Then, when they invited me as well, I willingly went with them. Now, we have only one faith in the Lord. I hope they will continue their good aspirations and duties in the Lord. This is where I found peace in my heart. I have already been to different churches, and then lately, my friend invited me. I went with him, and that’s when I saw that it’s different here. It’s different in the Church of God. Actually, he’s just new in the Church. 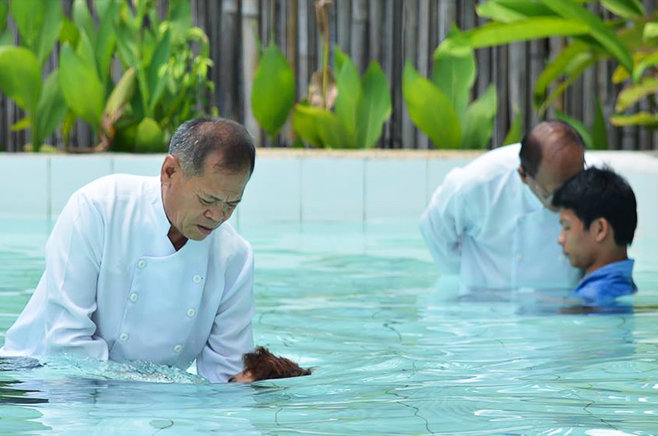 He has just been recently baptized, and he was just invited to the Church as well by his workmate. We learned so many teachings that we didn’t learn from the churches we formerly belonged to. There are many teachings that we must all remember, and keep in our hearts and minds that we may not sin against God. I felt that all the weight I carried on my chest were gone. It’s like you’re not thinking of any problem, but that you just have a new life. My message for Bro. Eli is that may he continue the good works he does, and lead many more people like me to return unto the old path. The teachings in the Church of God are good. At first, I listened only through radio, on Don Manolo Favis’ program. Then later on, I also watched on television. Actually, I think it has taken me ten years before I came to this day that I have been baptized. I hear the teachings that he [Bro. Eliseo] says, that the end of this world is drawing near. So I told myself, “I need to hurry that I may not be too late.” What he says really fit what is now happening in this age. I felt chills after I got out of the water. I hope that The Old Path will continue that many more people will be lead unto this Church. Bro. Romeo: We can’t find the answers in our minds to this, but perhaps in our hearts. We were perhaps searching for something. We were from Catholicism, from different religions even: Bread of Life, Word for the World, Word of Hope. Then by chance, we were able to listen to Bro. Eli Soriano on television as he was mentioned as well by my sibling who watches him. He’s not a member though. But then every time my brothers and sisters and I would gather and talk about the Bible’s verses, my brother who listens to Bro. Eli is different. As we listened [to my brother speak] as seekers of truth, it struck us as peculiar because we didn’t hear those things from other congregations and that we weren’t really learned when it comes to the Bible. But with him, the teachings that he shared with us are from the verses that Bro. Eli flashes on the TV screen. So from thereon, I felt I was challenged. One time, I saw him [Bro. Eliseo] on TV, and I felt drawn to the program. “It’s good,” I said. The things I was hearing, I could read in the Bible. Because before, I used to only hear [verses] from what pastors relayed to us, but I found that what they say is not what is exactly meant [by the verses] as when I heard them from Bro. Eli as he explained them on television and radio. So that’s when I started; I felt encouraged to listen from thereon. I would tune in to it from time to time, whenever I was available. It’s like I got hooked to it. Later on, my wife was onboard as well. I didn’t invite them [his family] or what. I just set the radio on as he preached the Bible. [At first] they were able to listen only by chance, like whenever they would pass by. But it wasn’t yet in their hearts. Perhaps, there are verses that are meant for us, wherein your heart will be touched or you’ll say, “Ouch.” It’s when you’ll see, through Bro. Eli’s reading of the Bible that [others’ teachings] are really just sayings of men, baseless, untrue. Until the time came for me, perhaps the Lord has also made me understand already, that the truth is indeed the word of God, nothing else. I also learned how to stick to [what is written]. You must not add nor take away anything from it. The Bible, as it turns out, according to Isa. 34:16, is already complete and doesn’t need any other reference. We used to see our brother as someone weird, but then, we became united in opinions eventually. During our Bible Study, we would unite in what is right, like what the Bible says: You have one Spirit, one song, one Lord, one God, one Church, one teaching. If only pastors would base their teachings, and would not add nor take away anything from what is written, but would all be based in the Bible, perhaps we will not be in strife. Sis. Estrellita: They are really God’s words. It’s like our hearts were the target, and it went right into it. Bro. Romeo: I didn’t force you, didn’t I? Sis. Estrellita: No. I just said, “I want to come with you. I want to listen personally.” I told him that on TV and radio, it’s like he’s jumping from one topic to another because he is answering whatever it is that people asked him. But when we started with [the indoctrination], I said, “Please take me with you.” So I went with him. That’s when I understood that what Bro. Eli says is so beautiful. It’s like a step-by-step teaching. Bro. Romeo: The biggest question we had regarding religion, the Bible answered. We have no doubts now. They were all answered by the holy words of God. Bro. Romeo: It felt so good. In other words, I felt fulfilled. Bro. Romeo: That’s what I heard from Bro. Eli. Whenever he was attending, despite not feeling well, he said that right after baptism or any Church gathering, the sickness goes away; you feel lighter. Though it may not be totally gone, you feel like it’s lessened. Sis. Estrellita: Bro. Eli, keep on doing the things that you do now. We pray for you, that your life will be longer, because you are able to help many people and their minds are enlightened by the word of God. The same goes for Bro. Daniel. He is very well; both of them are. So, many, many thanks to them, because at the least, our minds were enlightened unto the Lord through them. Bro. Romeo: I share the same sentiments for Bro. Eli and Bro. Daniel. What is said in Daniel Chapter 12, that in the last days, the wise shall understand the word of God, but the wicked shall not. You are but wise men, Bro. Eli, foremostly, compared to all the pastors that before persecuted him and told that [the Church] is a cult. But the way I see it now, as Bro. Eli said, “If we are Christians, we should be different from them from the inside, out. That’s what I saw now. That’s why, sometimes, they laugh at us because we’re not luxurious. We don’t follow the course of the world, which is in the Bible: That we should not conform but be transformed according to the will of God that Bro. Eli teaches. Many thanks to you. Long live, and may he give you many more believers whose lives you will touch. The same with you Bro. Daniel Razon, many, many thanks. To God be the Glory. 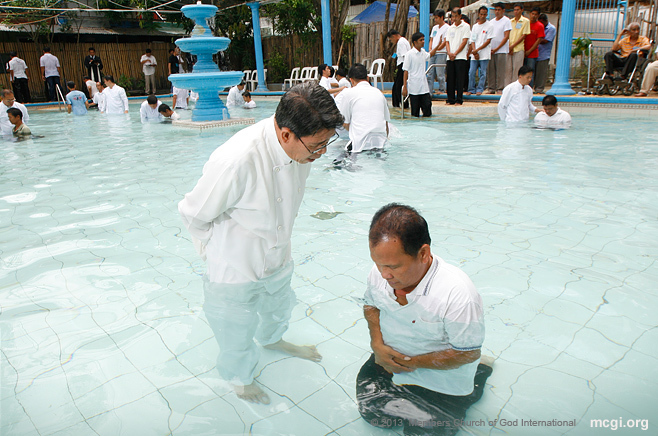 Read short testimonials of faith from some of MCGI’s youngest brethren baptized on June 12, 2015 at the ADD Convention Center in Apalit, Pampanga. The teachings are good. I was invited to the Locale of Camp Tinio. I was able to listen there, and told Sis. RJ that I wanted to be indoctrinated the following week as the teachings are good. I was indoctrinated in just three days as I wanted to be baptized in the week that followed. It was a whole-day session; Sis. RJ was really tired, but it’s okay with her as it is for the Lord. I feel okay. I’m happy… I was crying because of joy. Of course, when you feel the Lord, that you have accepted Him… You’re crying because He’s with you. Many, many thanks to you Bro. Eli, because you changed my life through listening to the doctrines that you preach. Many, many thanks and may God bless you more. I hope that your service to God will lengthen that you may be able to save many souls. I wanted to change and know the true God. It was because of my mother; I saw that she had changed her attitude. I then asked myself how my mother was able to change, and why I didn’t join [the Church] or take a look at it or listen to the doctrines. With God’s mercy I became [a member] today. I’m also thankful that I have accepted Him wholeheartedly, and that I was able to join the Church of God. My mother is also a new member. She became a member only this year; I think she is just less than two-months old. She somewhat encouraged me to join, and I want to do the same to our household to know the true Lord. It felt good. I felt relieved that my sins are gone, having repented of them. And I know that the Lord has forgiven me as well. Bro. Eli, Bro. Daniel, I hope that the Mass Indoctrination will grow wider, and that you may be able to save many more souls not only [here] but abroad as well. Let’s support each other. Bro. Francis: We have heard truth. Sis. Nenette: The teachings of the Church of God are better than those of my former religion’s. Bro. Francis: We have listened to The Old Path through TV and radio for many years now. We religiously listened to the teachings and have accepted them right away. Sis. Nenette: We voluntarily went to the Locale in Lipa, and it was where we attended the indoctrination continuously. And it was through my co-teacher, who is also a member, that we were able to get there. Bro. Francis: I have long heard [Bro. Eliseo], and I was looking for someone I know [who is a member] to guide us to The Old Path. Sis. Nenette: I was the one who went to ask her in person. She probably rarely [opens Facebook]. Bro. Francis: Then as we have been attending for two indoctrination days already, I saw someone I knew, who I didn’t know was also a brother. That’s the only time I knew. Sis. Nenette: As [Bro. Eli] said from the Bible… What I felt is really hard to explain. Bro. Francis: At first, while I was just in line to be baptized, I felt nervous, and I didn’t know why. But after I got immersed, I have forgotten all my sins and never to commit them again [with God’s help and mercy]. Bro. Francis: I hope that they will continue speaking the words of God that many more may hear it. I hope that many more brethren will be encouraged to join, because this is where I saw and understood the true meaning of the Bible, of God’s teachings. They are taught and explained one by one, which aren’t taught in other religions, in my former religion. It’s only here where I found and understood those things in such a long period of time. Sis. Nenette: I share the same sentiments. I feel that I am already prepared to receive the doctrines that I have heard since [I was a kid]. When I started in college, I wasn’t able to attend [in the KNC]. We have a store and I was the one assigned to that; I would go there after school. Then, I also studied. It feels good inside as I have long dreamed of it. Actually, after [graduating] in the KNC, I already wanted it…So I’m really happy that I have now been baptized. I’m thankful to them [my parents] for establishing us; they were able to send us to school. Now, they still guide us and I’m a member now because of their guidance as well. For Bro. Eli and Bro. Daniel, may they continue spreading the words of God which they have started before, and may God continue to guide them. 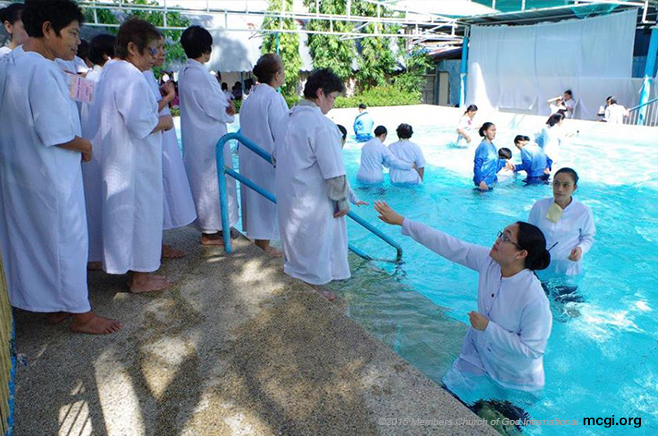 Read short testimonials of faith from some of MCGI’s youngest brethren baptized on May 15, 2015 at the ADD Convention Center in Apalit, Pampanga. I believe in the things that Bro. Eli says, because they are based on the Bible — nothing more, nothing less. It’s unlike in other groups wherein they just invent some words, some doctrines. I’ve long been listening [to Bro. Eliseo] since about 2006 on television, when I was just surfing channels. Actually, I was sort of an atheist back then. But I believed Bro. Eli because he isn’t a hypocrite. He’s unlike others who just pretend to be holy. He really has basis in what he says. As time passed however, the number of questions I had that weren’t being answered multiplied. There are still many things that the people of the world do not know, and we will just arrive at the conclusion that there really is an Almighty Being, a God. For example, let’s ponder on this: Who makes the world go round? Science would credit it to the gravitational pull of other planets. But where did gravity come from? Who makes the sun shine? They will say evolution. But from whom did the heat of the sun originate? So we will reach the conclusion that there is God. Then, there’s the DNA, the chromosomes, the tiny bits of matter that we see. But the structure of the chromosomes is so intelligently done. Can man do that? How about us? How did we come about to be here on this earth? Did we program ourselves to be here or did we come to exist here because of our will to be alive? We can’t even choose what our desired race would be. We just turned out to be Filipinos, [we can’t even choose] to be born poor or rich. Fathoming many things, we will really just conclude that Someone truly created us. There really is God. Since I was an atheist before, I told myself that I would just be good, that I would just do good. I didn’t commit anything ill against my fellowmen, despite not believing in any god before. It’s because I would see many people [practicing religion], and I would just get irritated. When my friends went to church, they would attend mass just to look at girls; then they’d go out afterwards. It just seemed wrong. I didn’t confront them about it though. They would go to mass only on Christmas, on simbang gabi. When they would have to make efforts to wake up before daybreak they would go, but not on the weekly mass. Things like that. I heard Bro. Eli as I was surfing channels then. Actually, I already knew Bro. Eli even before that. I then thought, “Oh no! He’s right. It’s sensible.” I consider Bro. Eli as an authority because his sole basis is the Bible. He doesn’t invent things, not his own philosophy, but the [righteousness] that is in the Bible. That’s it. Thanks be to God that I got baptized. You’ll remember all the sins that you have committed, and it will just bring tears to your eyes. Then, after being immersed in the water, you feel like you’re a new person. To Bro. Eli and Bro. Daniel, many thanks for the words [of God] that you bring to many people: Not only to Filipinos, but to everyone in the whole world who needs spiritual education. Bro. Eli and Bro. Daniel are really a great help to us. I hope that you will continue your works, and that you may have good health as well, especially to Bro. Eli as he is getting old. Before, when I watched Bro. Eli on TV, he was still young. Now… I just really wish them good health, and that all the brethren be kept safe. It’s because the way Bro. Eli teaches the doctrines that come from the Lord is well. My boyfriend was first to become a member. He was baptized just last November. Then, he always brought me with him every time he attended worship services. I think it was in November when he brought me to a [Thanksgiving] service the Saturday after he got baptized. I felt drawn to listen continually until I finished the indoctrination. It feels light inside, like all your worries in life are gone. I hope they will continue preaching and leading people to join the Church. I heard them [Bro. Eliseo and Bro. Daniel] in 2008. There was a sister in faith, our neighbor, who invited me here. But I only got enlightened about it when I attended the indoctrination. She has long been inviting me. Whenever there are Church services, she would invite me, like in the [recently concluded] three-day event. After that, I underwent indoctrination in April. My children and I are all devout Catholics. My two sons are altar boys, and my daughter is a choir member. I have three children. Then in recent years, my children would always ask, “Why is it like that?” There were many questions, so we investigated first. What I have heard from [the indoctrination] are really good, and I somehow gained knowledge in the Bible, because there’s nothing like it in Catholicism. I was happy and nervous at the same time. I can’t explain why. I’m very thankful for what we have learned and heard from them. I know this to be the true Church that’s why I joined here. My aunt is already a member. Then, she would invite me [to Church services], and I would attend the KNC [Kawan ng Corder or Flock of the Lamb]. Then, my KNC-mates already attended the indoctrination last time, so I decided to follow suit. I just noticed that it’s different in other religions. Then, I heard Bro. Eli. That’s when I knew that this is the true Church, so I joined. When I was being asked [by the baptizer], I was crying. I’m happy that I’m finally here in the true Church. I hope that Bro. Eli will always be in good health. I’m thankful to God that he was the one used by Him to preach to us.